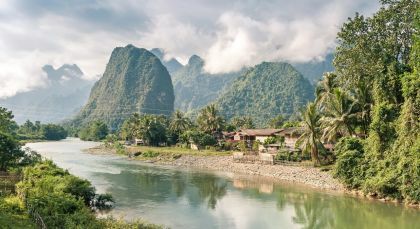 Discover hidden gems, incredible natural beauty and a unique way of life on your custom Laos tour. Cruise gently down the Mekong River observing the daily life of hill tribes and local villages until you reach Luang Prabang – the jewel of Indochina. Soak in the alluring mix of the past with the present and continue on to the quaint riverside town of Champasak, where ancient ruins and colonial architecture await. 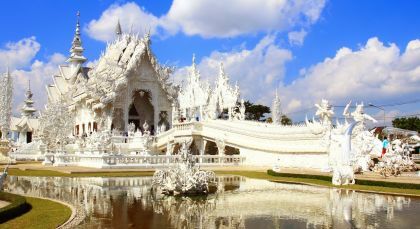 Chiang Rai is a quaint 13th century town, surrounded by two mountain peaks, Doi Mae Salong and Doi Tung. 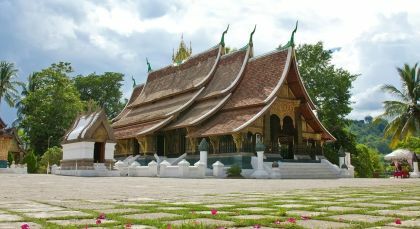 Capital of Bokeo province and northern gateway to Laos, Huay Xai is a popular entry point to Laos from northern Thailand. Luang Prabang is considered the jewel of Indochina, and is a designated UNESCO World Heritage Site. 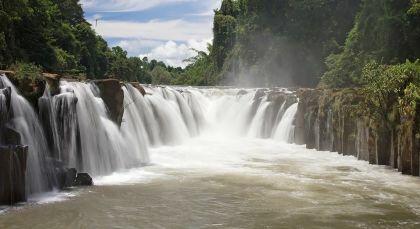 A one-hour drive southwards takes you to one of Luang Prabang’s most picturesque sights: Kuang Si Waterfalls. En route, halt at Phosy market where local people trade fresh produce. At the Kuang Si Waterfalls National Park, take a leisurely hike until you reach the waterfalls. You can venture up to the main waterfall and even swim in a large pool. Enjoy a picnic lunch before traveling by car to the Living Lands Rice Farm. Here, meet up with a local farming guide, be invited to interact and experience the rice harvesting operation, and see how different tools are created. End your tour with a tasting of traditional food items that include rice. You will leave with a new appreciation for rice, and an admiration for the Laotian people who continue to harvest rice without modern machinery. At mid day, you will return to your hotel. Arrange an optional pre-dawn start with your guide (0530 hrs) to witness Tak Bat, or alms-giving ceremony, to hundreds of saffron-clad monks – an awe-inspiring ancient ritual. Visit a bustling morning market before returning to your hotel for breakfast. Take a guided audio tour of the Royal Palace Museum, housing precious possessions of the former Lao Royal family. Explore various architectural feats, including 19th century Wat Xiengthong Temple, and Wat Visoun, nicknamed the watermelon stupa. Gain insight into the ethnic culture at the Arts and Ethnology Center, and head to the textile villages of Ban Xangkhong and Ban Xienglek. Ascend 328 steps up Mount Phousi to watch the sunset over the Mekong. Kindly note that the Royal Palace is closed on Tuesdays. Champasak is a quaint and unique riverside province in southern Laos. Aquatic adventures await! After a hearty breakfast, step aboard a private boat for your full day tour of the 4,000 islands in Si Phan Don. At the picturesque island of Don Khone, you can take a bicycle ride through the French colonial-style remains, past abandoned railway tracks to the furious Liphi Waterfalls which is also called the Corridor of the Devil. The return journey will take you to the spectacular Khone Phapheng Falls which stretches for an impressive 10 km. Don’t’ miss your chance to see the rare Irrawaddy dolphins from a boat which takes you to the deep pools near the Cambodian border. In the late afternoon, a car will take you back to Khong Island. 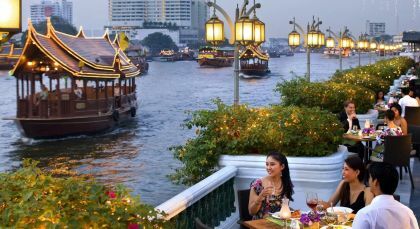 Bangkok is a quintessential blend of old and new! Meaning the city of angels, Bangkok is the capital city of Thailand – and is its largest metropolis.